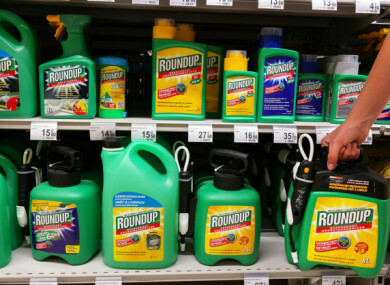 A SAN FRANCISCO judge has upheld a jury verdict that found Monsanto liable for not warning a groundskeeper that its weed killer product Roundup might cause cancer, but slashed the damages award. Judge Suzanne Bolanos denied Monsanto’s request for a new trial but cut the $289 million (€252 million) damages award to $78 million (€68 million) to comply with the law regarding how punitive damages awards must be calculated. Jurors in August unanimously found that Monsanto acted with “malice” and that its weed killers Roundup and the professional grade version RangerPro contributed “substantially” to Dewayne Johnson’s terminal illness. “Although we believe a reduction in punitive damages was unwarranted and we are weighing the options, we are pleased the court did not disturb the verdict,” Johnson’s lawyers said in a released statement. Johnson’s lawyers told AFP they are considering which option to pursue. “That said, today is a triumph for our legal system,” Johnson’s lawyers contended, calling the judge’s ruling “an important win”. Monsanto-parent Bayer has vowed to appeal the case. “The court’s decision to reduce the punitive damage award by more than $200 million is a step in the right direction,” Bayer said in response to an AFP inquiry. Monsanto attorney George Lombardi argued in court earlier this month that the evidence presented at trial did not sufficiently back the verdict, and that an attorney for Johnson was wrong to urge jurors to teach the company a lesson. Johnson’s lawsuit built on 2015 findings by the International Agency for Research on Cancer, part of the UN World Health Organization, which classified Roundup’s main ingredient glyphosate as a probable carcinogen, causing the state of California to follow suit. Monsanto has defended the weed killer, arguing that it has a history of safe use that dates back more than 40 years. At the time of the verdict, Johnson’s lawyer Brent Wisner called the ruling the “tip of the spear” of litigation likely to come. Despite its denials of any links between its products and ill-health effects, Monsanto has already suffered hits to its reputation in light of the controversy. Records unsealed earlier this year by a federal court lent credence to Johnson’s claims — internal company emails with regulators suggested Monsanto had ghostwritten research later attributed to academics. Email “Company behind Roundup weedkiller still told to pay €68 million to gardener living with cancer after judge ruling”. Feedback on “Company behind Roundup weedkiller still told to pay €68 million to gardener living with cancer after judge ruling”.